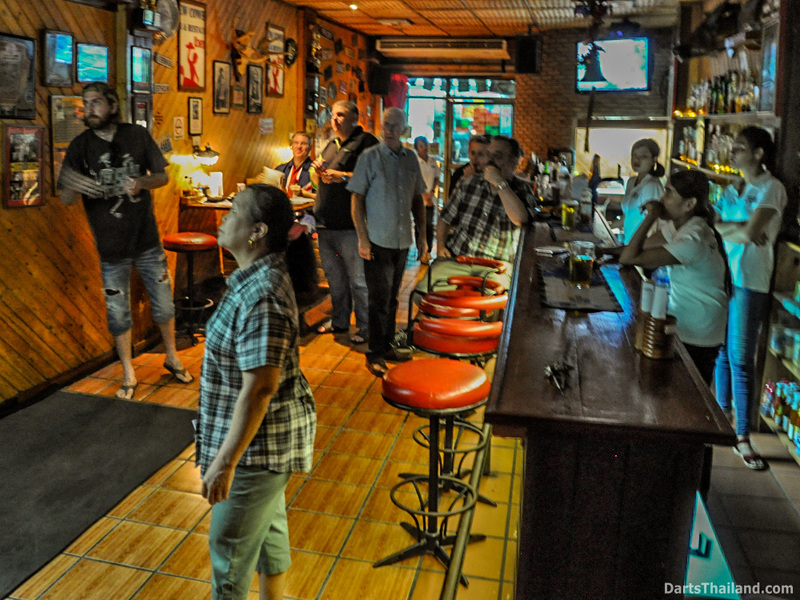 Friday 07 Oct – proved the adage “Dart Players from Around the World Meet at New Cowboy Darts Club.” On the eve of the PEA Open there were more darts players than usual in Bangkok and we were most fortunate to have many meeting up at the New Cowboy darts oche. 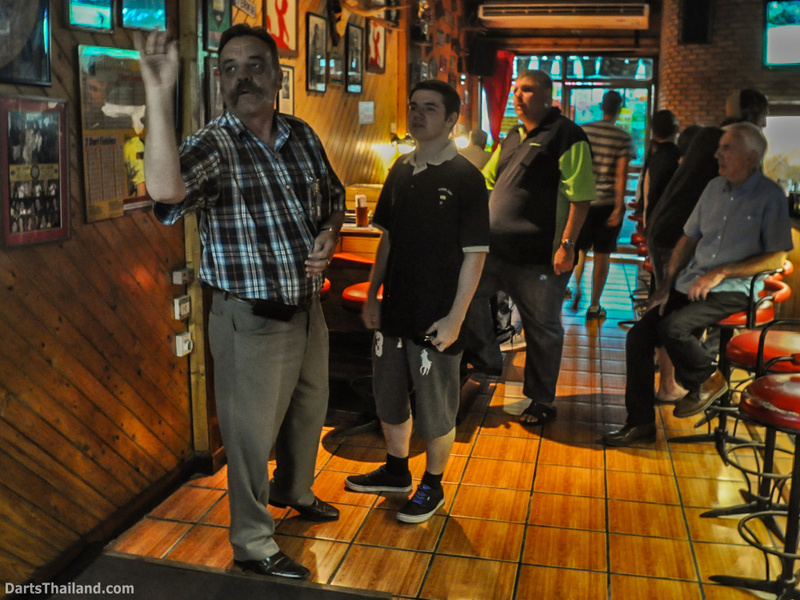 When darts players gather it’s always a reunion kind of atmosphere – even those meeting for the first time discover they have so many mutual friends. 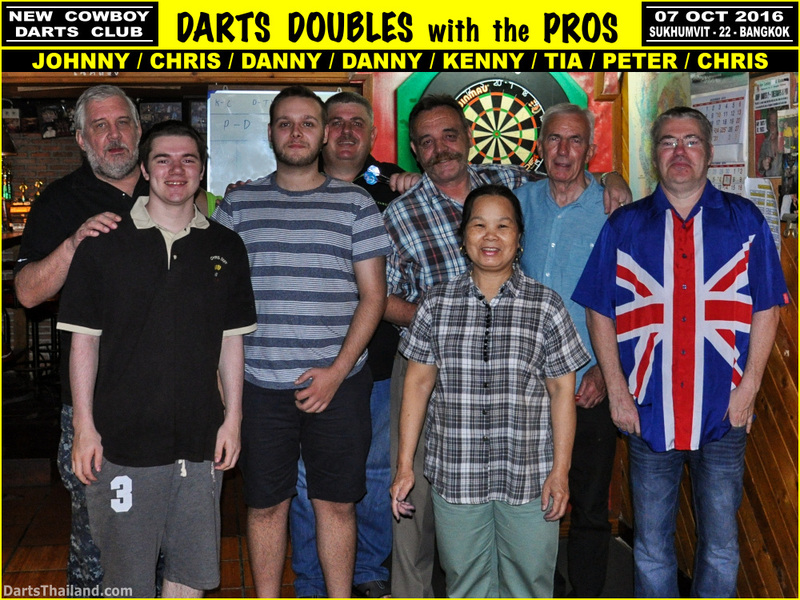 New Cowboy’s own highly skilled in-house pros – Miss Tia and KTD (Kenny-The-Dart) were ready to meet all challengers. We were expecting Simon – visiting Thailand with Eve and their young daughter. 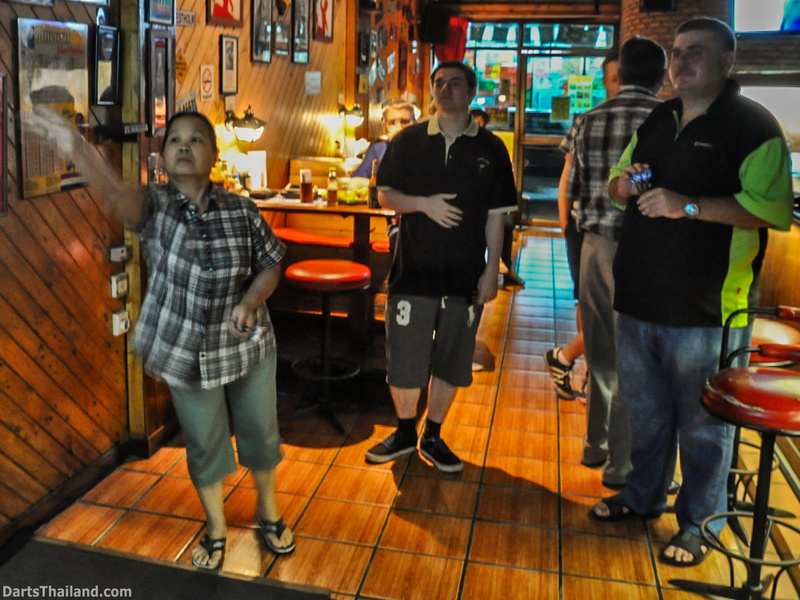 Simon and Eve were regulars of our Friday Night darts events a while ago. We missed seeing Eve as she was taking care of their young one and spending their limited time in Thailand with her family members. We look forward to seeing you Eve on your next visit. 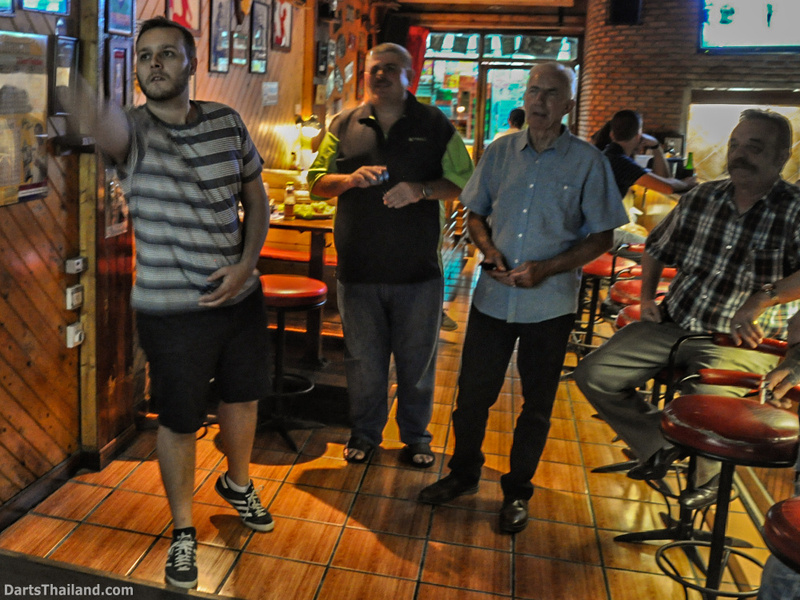 Great again seeing you Simon – and although you said you hadn’t played any darts since you’d last been in Thailand – your performance at the oche was good – maybe motivated by the skillful level of players in attendance. Simon left early meeting up with more friends so we didn’t get him in the group photos of the night. 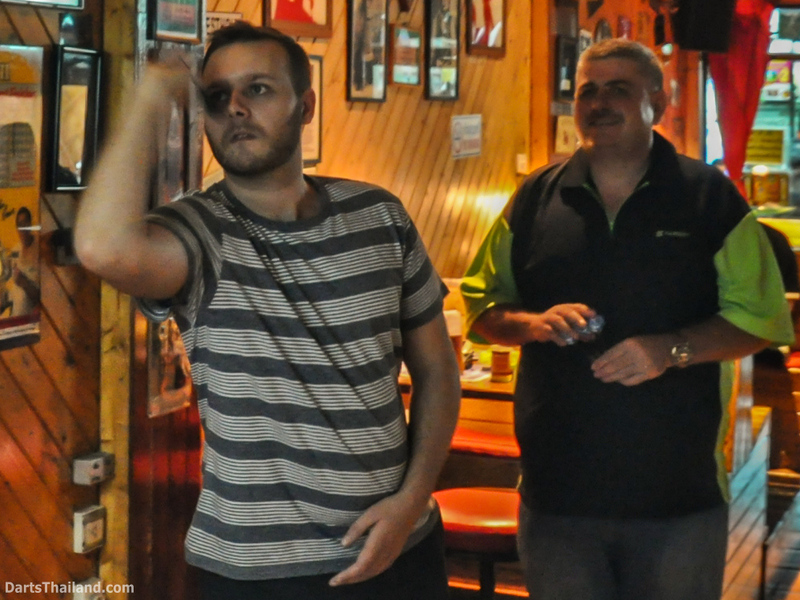 In town for the PEA Open were Chris & Chris Duff. This father/son duo are so skilled that we had to separate them onto different teams on the night. You’ll notice some action pics of young Chris but none of his father. Looking at my photo file of the night I could not understand on how even I could make such a goof. 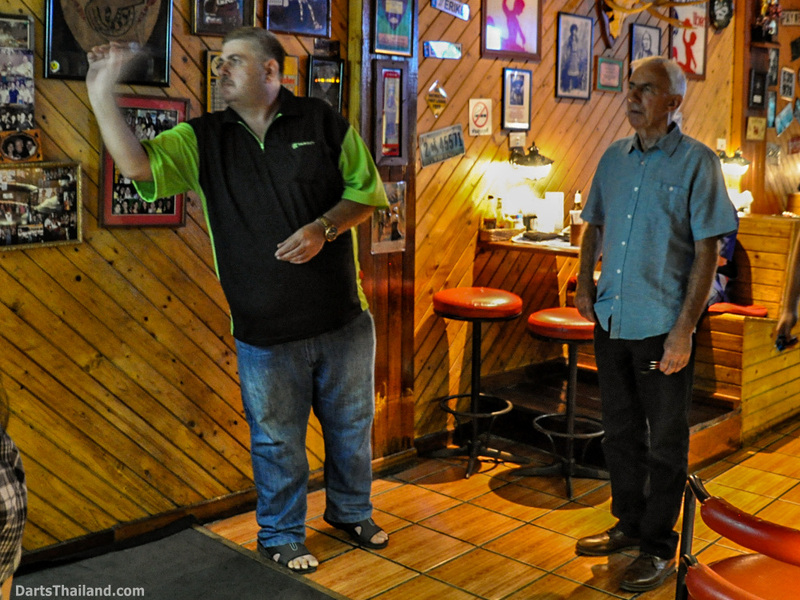 Ah then I realized – Chris – you were misfortunate enough to be paired with me on the night’s doubles. 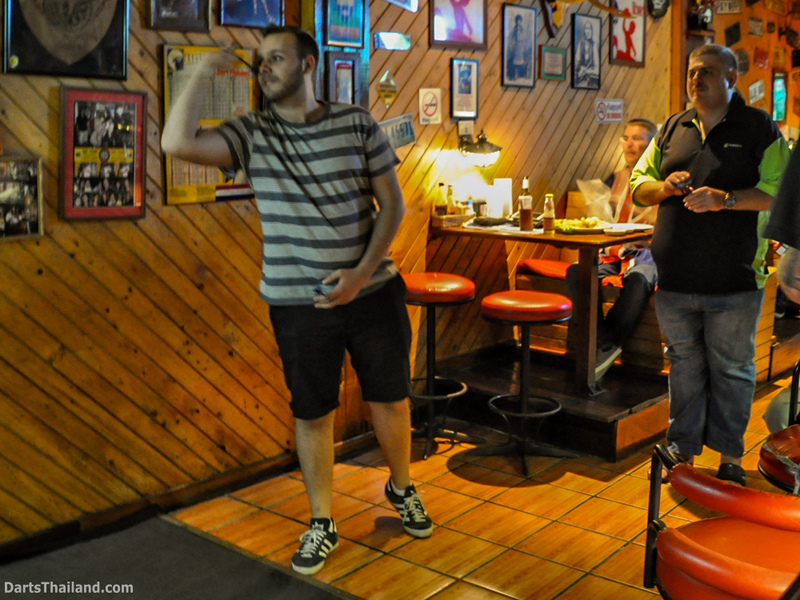 And for how little I contributed to our score – I should have stuck to only shooting my Nikon D90. We’ll make up for the lack of your action pics on your next visit. 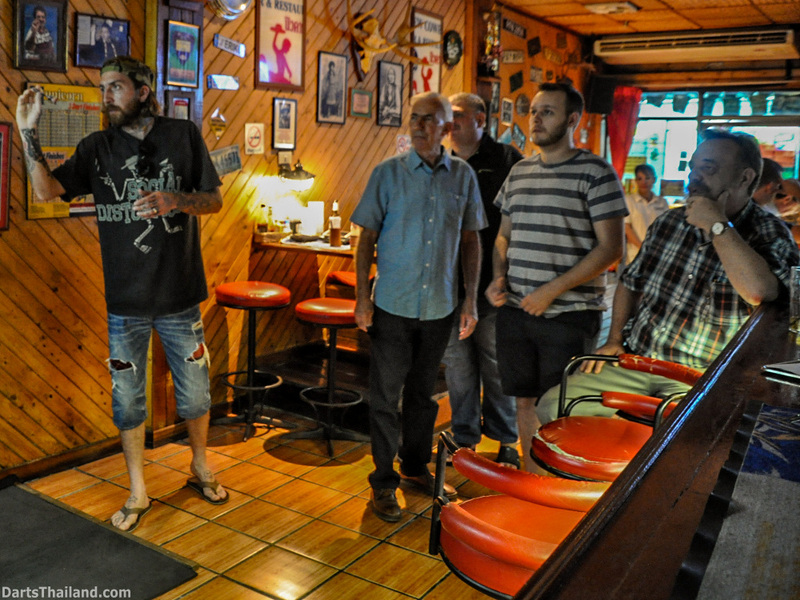 We look forward to your next visit Chris and hope they continue on an even more regular basis. 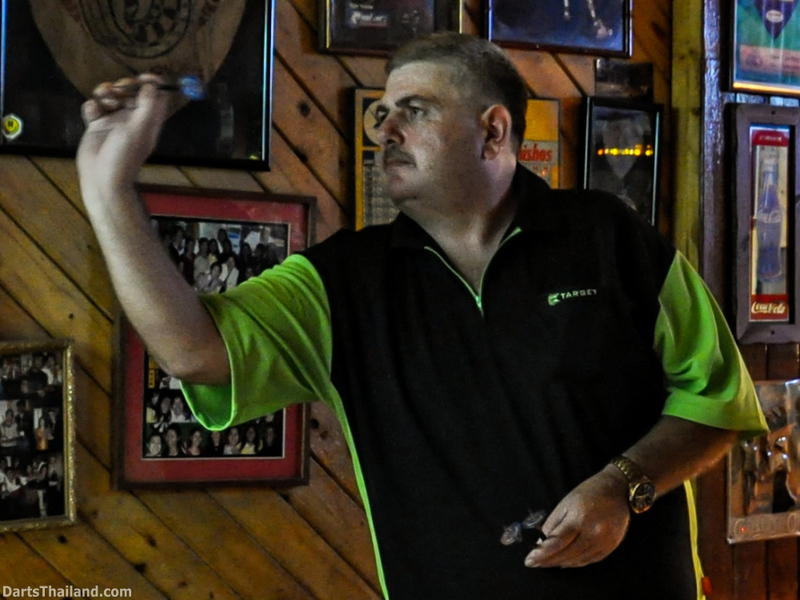 Down from Chiang Mai – also in town for the PEA Open was Danny Fyrth. 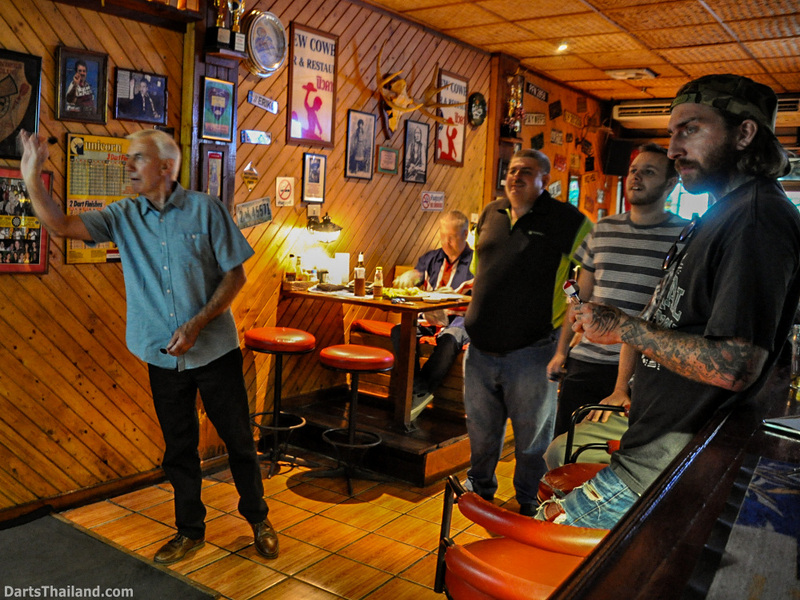 This was a one of two special meetings for me – although I’ve known Danny for some time via FaceBook it was our first in person meeting. Danny is quite a skilled player with a history of playing in the UK and is definitely Chiang Mai’s gain and the Isle of Wight’s loss. 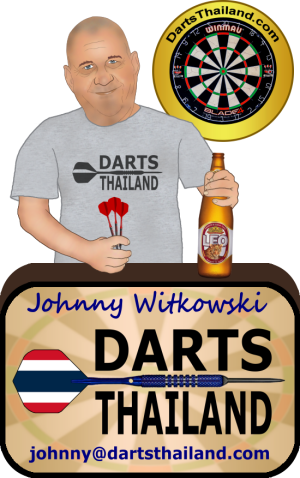 I’m most happy to announce that Danny will be keeping us up to date with the Chiang Mai darts action with his reports and photos. 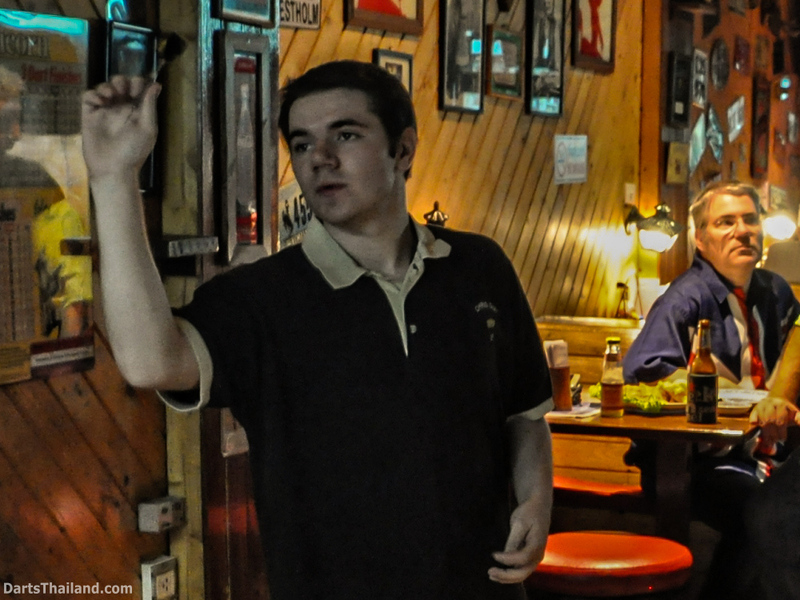 It’s certainly a pleasure to welcome you – Danny to our DT Team. 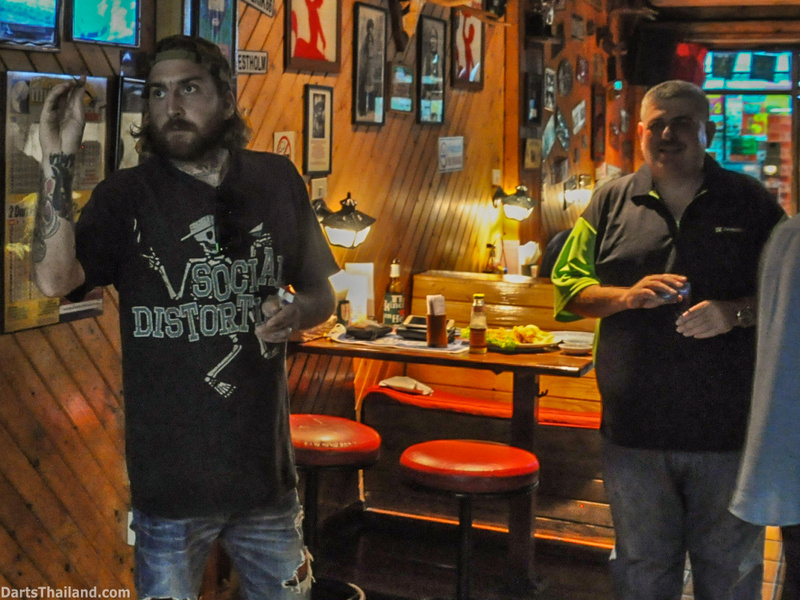 More about Danny in an upcoming DT feature article. 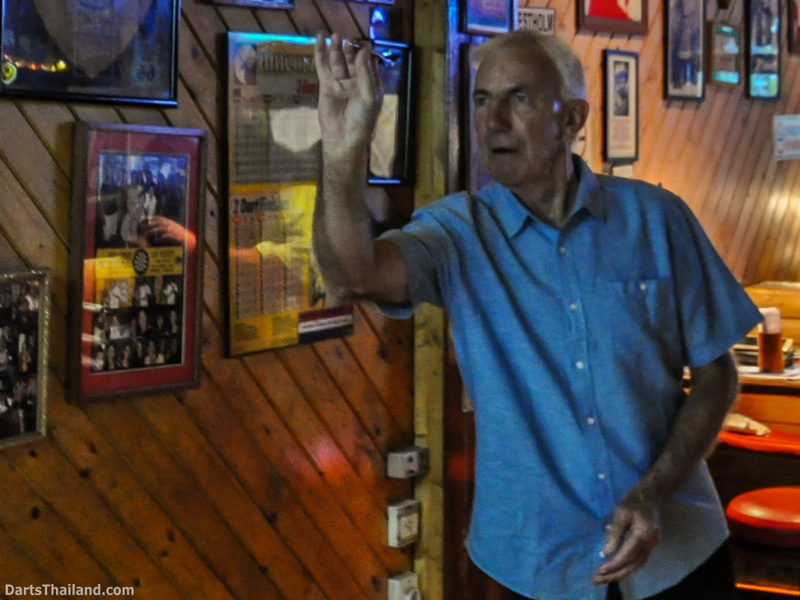 Last but certainly not least – Peter Rushby and Danny Golden arrived – totally unexpected. 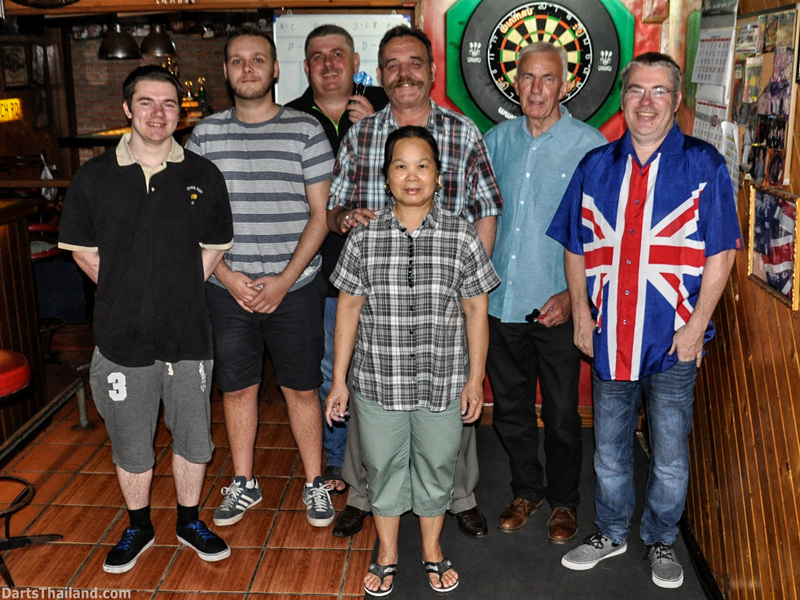 This powerhouse darts duo from Leeds City in Yorkshire were here for both the PEA Open and then going onto the Malaysian Open. 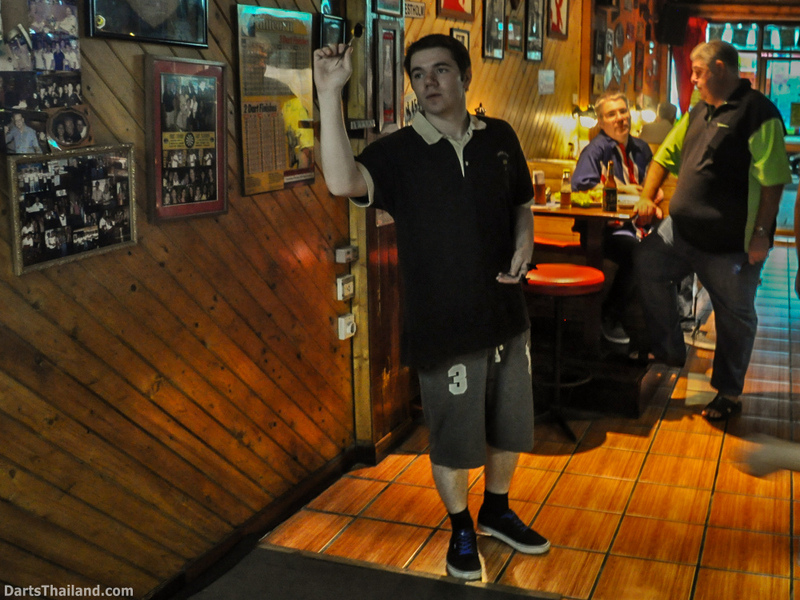 Danny quickly proved his proficiency at the darts oche and it’s no wonder that they play on the same team back in Leeds. This was my second special meeting – knowing Peter for eight or so years via FaceBook but meeting for the first time in person. 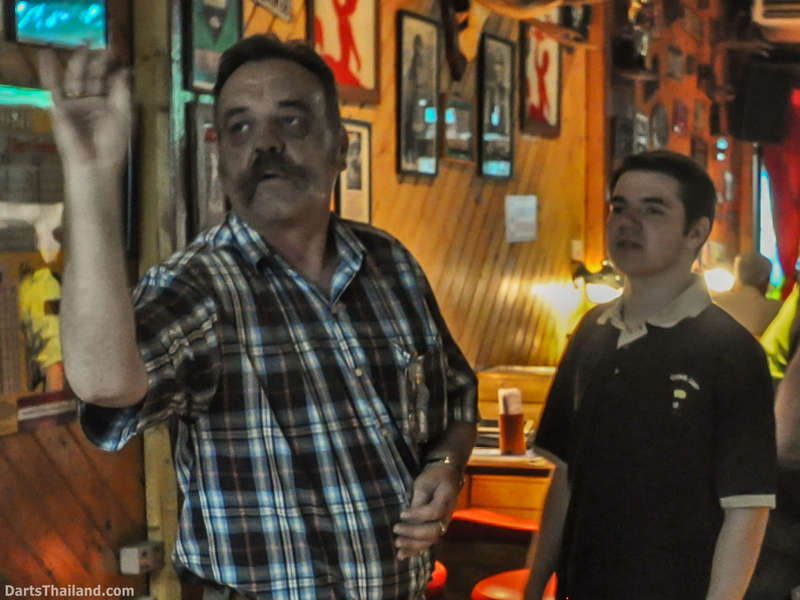 Peter has served as DT’s historian since way back on the old DT format monthly newsletters. We’ll be reorganizing Peter’s contributions including some vintage photos for easy access on our current DT site. 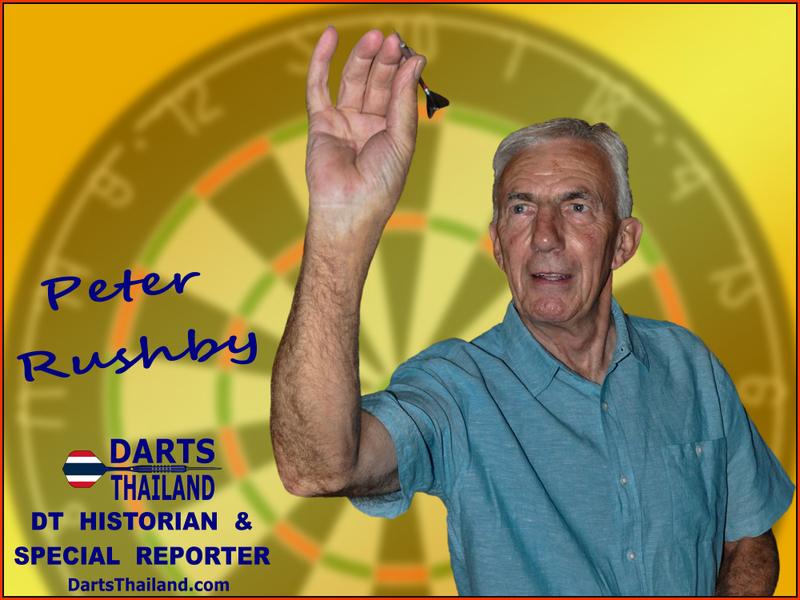 Peter is a Thailand darts legend playing in every Thai Open back in the day. But we’ll leave this and much more for another upcoming DT feature article. 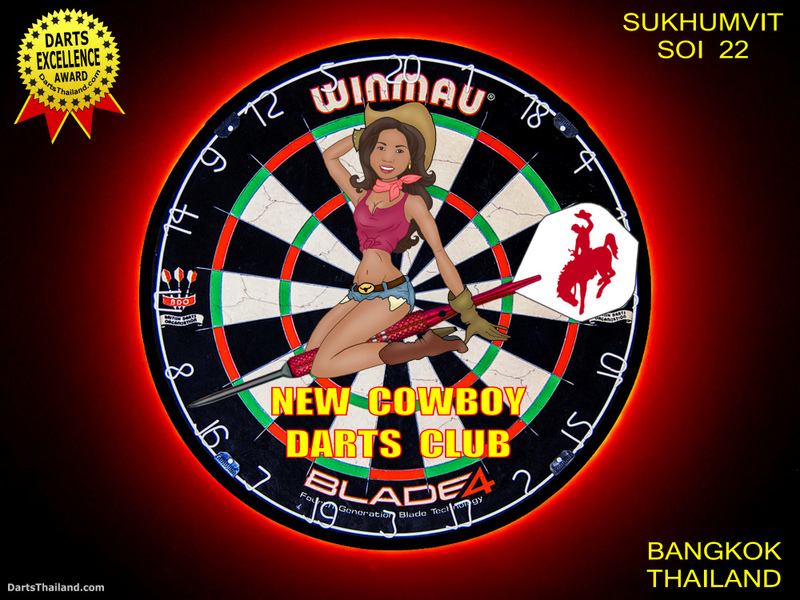 On behalf of the entire New Cowboy Darts Club – I’d like to thank our most excellent host venue – New Cowboy and especially Miss Tia and her fine staff for all their continued support that makes this such a popular darts venue. Remember all new players are welcome – you need not be a pro. 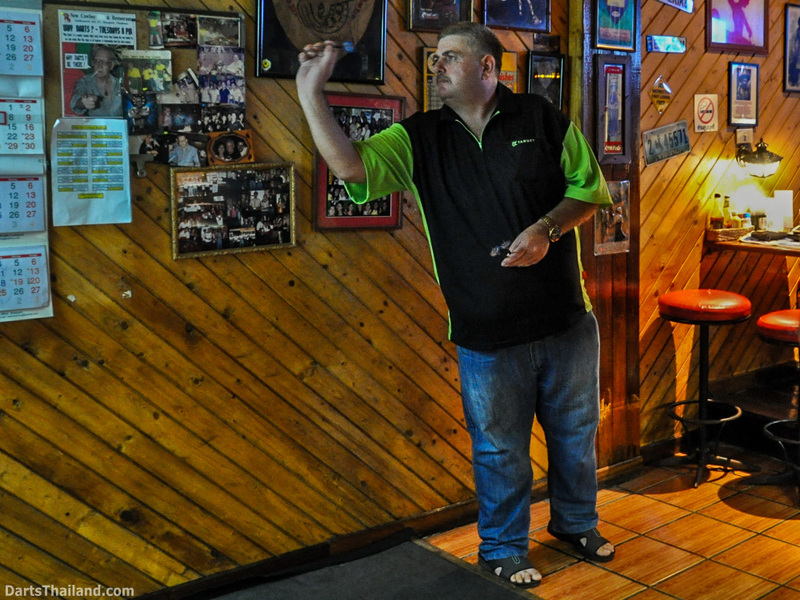 The most important darts players are the new ones that eventually bring their enthusiasm and increasing numbers to our beloved game of darts. 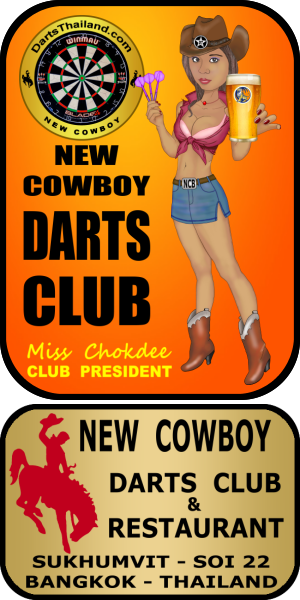 Look forward to meeting you at New Cowboy’s darts oche.